Tired of monotonous training at gyms that care more about membership numbers and state-of-the-art machines or facilities than your results? 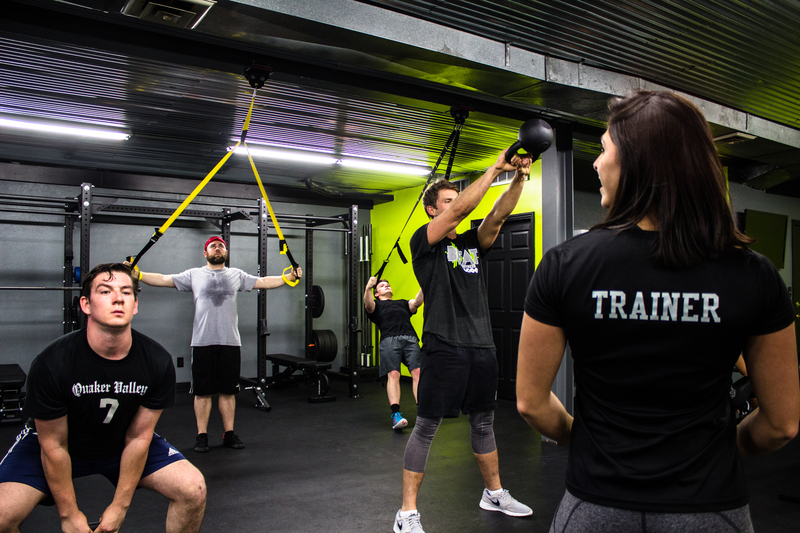 Consider our functional fitness training in Cranberry Township, PA. BEAT Fitness specializes in functional fitness training. The trainers at our Perry Highway facility are dedicated to helping you learn the science behind functional movement and correct ergonomics to sculpt a better you. Functional fitness training refers to one specific exercise, or a group of exercises, intended to improve one’s performance carrying out life’s everyday tasks. It’s all about training with the mindset of improving your quality of life outside of the gym. Increasing your capacity for daily tasks, recreation, and play. This could be carrying your laundry or groceries up the stairs without struggling or getting short of breath. Not being worn out hoisting your child on your shoulders at a fair or chasing them around North Park. Whatever it is you have to do everyday that would be easier with improved conditioning. Life doesn’t break up its daily tasks by muscle groups like most of us workout. Life doesn’t say, “Okay, today we only work your back and arms.” Even the most simplest of tasks typically utilize both the upper and lower body plus multiple muscles and joints. The point of functional training is to develop strength, coordination, balance, and improved range of motion in a controlled environment. Things that can be applied to your daily life outside of this controlled environment. Much of what most of us do at the gym is impossible to recreate outside of it. It has little to no practical use in real life. The best way to improve both neurological fitness (coordination, balance, accuracy, and agility) and physical skills (strength, stamina, endurance, and flexibility) is working out multiple muscles and joints as one unit. Not isolating individual muscles. You workout your body by moving it. Not sitting or lying down stationary at a machine or with dumbbells. Even if you’re already in good shape, our functional training can only improve your core stability and strength. Everything from your balance and coordination to your posture is enhanced. Injuries are reduced. Lower back pain in particular can be alleviated. Is Functional Fitness Right For Me? The beauty of functional fitness training is its scalable. BEAT Fitness has courses to suit anyone’s level of fitness. The intensity, resistance, and duration of exercises can be adjusted to any individual’s level of fitness. If you’re someone that gets easily bored with exercise, it’s important to know that our Cranberry functional fitness training is varied and differs from session to session. The monotony of a traditional gym workout is non-existent. Your return on investment is also quicker. You acquire increased capacity in all fitness domains. This enables you to do more of whatever you want to do. This is real fitness training. GET A FREE CRANBERRY FUNCTIONAL FITNESS SESSION! BEAT Fitness has a variety of plans available for anyone interested in functional fitness in Cranberry PA. In fact, we offer a first session at absolutely no cost. Click here for more details or give us a call at 724-900-0323.